Eight studies showing God's perspective on work, whether at home, at an office or in a factory. Most of us spend most of our waking hours at work. It takes up most of our energy and often most of our emotions. It is at times really fulfilling, and at other times utterly frustrating. It keeps a roof over our heads and food on our tables… but is there any more to work than that? Christians can feel that what they do Monday to Friday is irrelevant to their faith; or, worse, gets in the way of them living out their faith. Others who don’t go to work in an office or factory can feel that they are of little worth. Could work—should work—be anything more than something to go to, make money at, and return home from? The Bible’s answer is: Yes! Whether you go out to work, or are a parent whose work is at home… whether you’re out of work, starting your first job, running a company, or retired… these eight studies will show you, excite you and challenge you with God’s perspective on working in His world. Why study Making work work? We are following this book in the Christian fellowship at work. I am often rushing to the meeting in the middle of the day with little (any?) prep and a head full of work thoughts. 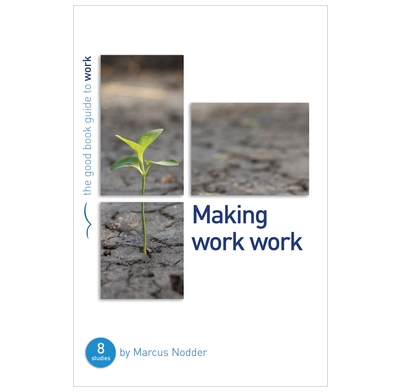 The booklet works well - I read the questions and we get a good discussion going that helps us view the challenges of work from a Christian perspective, and provides encouragement to take back into the workplace. We are a church sponsored house group ranging from a student to a pensioner. We like to tackle relevant topics from a Biblical viewpoint. This book looks at work in every sense beginning with God's creating work and covers aspects such as Trouble at Work, Worry at Work and Witness at Work. The book is laid out clearly and it is straightforward for the leader. It involves active participation and opportunities for group members to share their experiences.